Over the years I've been through some changes; a shift of priorities, a myriad of awakenings and a lifestyle overhaul. None of this has been easy on me. For every blessing there will be a trial and for every hardship there will be great hikma (wisdom) and triumph. I've drawn strength and inspiration from all my experiences and I'm slowly growing wiser, becoming more balanced and feeling more comfortable in my skin. Be as independent as you can. Allah has given women the prerogative to seek freedom and fulfillment by worshipping Allah and not His creations. There is no harm in seeking knowledge and earning an income because it is virtuous to practice self-compassion and seek provision for yourself and your family. Be a source of inspiration and strength for those around you. This means we must not be afraid of doing the right thing when it's hard; we must challenge ourselves and others too, if it will help them to become better people. To challenge someone out of love and mercy is very different than to challenge someone due to one's ego and being outspoken is not the same as being rude. To teach someone to think for themselves is a great act of love and concern. Be self-confident. Khadijah was not a selfish and insecure woman; she wasn't afraid to voice her opinions and make sacrifices when she needed to. She was willing to give her wealth, time and energy to help others. Furthermore, despite being widowed twice, she had the courage to propose and marry a man who was 15 years younger than her because she fell in love with his impeccable character. If that doesn't scream self-confidence, I don't know what does. 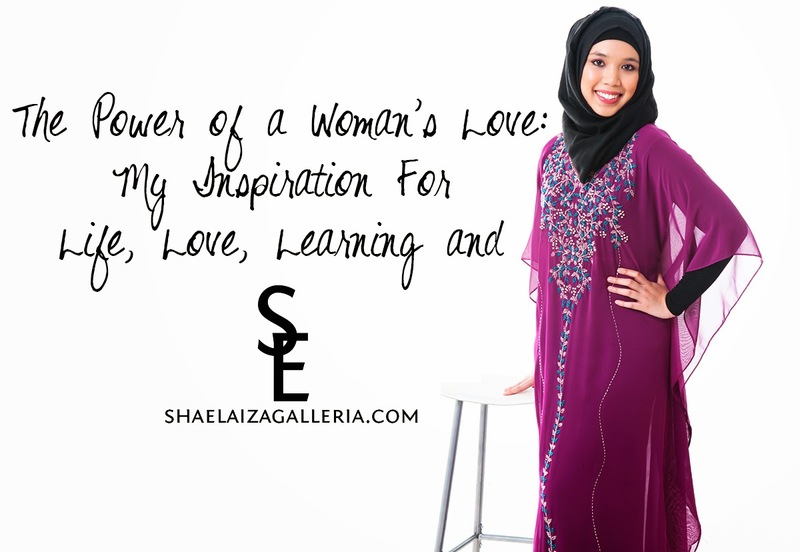 I've decided to pursue entrepreneurship and establish ShaElaizaGalleria.com because if a woman like Khadijah could embrace and dedicate her life to Islam and a livelihood, I know this faith could not be a tool of oppression and suppression as many have claimed and portrayed it to be. Prior to marrying the Prophet (pbuh), she was already a distinguished and successful female entrepreneur. Khadijah was highly-educated, financially independent, confident, determined and perceptive. At the same time, she was also a mother and a widow. She was the kind of woman many men and women would look up to today and perhaps be intimidated by. But Khadijah was the kind of woman who wouldn't allow challenges or social stigma to get in the way of her success and happiness. She saw something special in Muhammad (pbuh), a staff she had hired for her thriving textile business, and she admired and respected him because of his fine character which made her feel at ease. Despite being 15 years older, Khadijah did what would be considered unthinkable even by today's standards. She trusted her intuition and proposed to Muhammad (pbuh). When he received divine revelation and became a prophet after 15 years of marriage, she was the first to accept Islam and dedicate everything she had to spread the noble message that God is one and Muhammad (pbuh) is His final messenger. Being a strong woman only enhanced her ability to be a devoted wife and Muslim. One could even say that it was the power of a woman's love that contributed to Prophet Muhammad's (pbuh) tenacity and charismatic leadership. Today, many have forgotten the extent of Khadijah's influence on the Prophet's life and character. Many Muslims tend to place great emphasis and significance on raising little Muhammad's but not little Khadijah's. Imagine an Ummah without strong, knowledgeable and confident women. What a travesty that would be! Islam empowers women and raises their status. Allah (subhanahu wa taala) wants both men and women to be successful in this world and the hereafter. For a long time after wearing hijab and fully embracing Islam as my faith, I felt disempowered and conflicted about my role as a woman and Muslim. Alhamdulillah, it was due to His mercy that I have learned much of what's told to Muslim women about being the "perfect" Muslimah is based on misogynistic patriarchal standards and not Islamic standards. I am determined to help women by empowering them; by making them realise their true potential lies within life's challenges and it is completely possible and mustahab (recommended and virtuous) to turn your life around and make the changes you need to improve yourself and add more presence, passion and value to your life and others' lives too. I hope to overcome my fears and apprehension and become more dedicated, disciplined, patient and tenacious in everything I do, inshaAllah. I hope to be more committed to my faith and spirituality. I hope to become more like my role model, Khadijah al-Khuwaylid, inshaAllah, because the power of a woman's love can change the world. What have you learned from Khadijah? I'd love to know so feel free to drop your comments below! Khadijah has taught me women have the power to inspire and be self-suffiecient. They don't need a man to complete them, Allah made them whole as is. Marriage is a blessing as a woman or a man, but it doesn't define us, we define us. I think its important to preach that to our ummah, especially our young Muslim girls. Sha, I love your inspirational words and you are one of the many sisters I look up to, MashahAllah. I have learned, through Khadijah (May Allah be pleased with her), that women are the backbone of society. It is only through women that true progress and prosperity could ever be achieved. Faith Friday: Why Isn't God on My Side?